I quite like rewriting. There's a sense of security over having the initial run of words done, and now refining the story. Editing is not rewriting. Editing is that finetuning that can be done with one eye on the clock. Rewriting engages the same gear as writing, except that it's perhaps more like darning, as one has to blend the patch of new fabric seamlessly into what exists of the first run. Sometimes, rewriting works as a result of a decision made to change direction. Often something didn't quite work first time around, and a new idea or device will oil the works. Usually I would never advocate authorial intervention, but since I'm writing pseudonymously at present the writer-persona is legitimately one of the characters. I am typing this with one dog on my head, (perched on the back of the chair) one under my left elbow, and a third sprawled half across the computer. I'm not sure where the fourth one is, but, much as I love him, I trust he won't join the rest of us in the chair just now. Mind you... I owe them all. 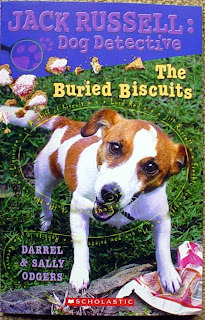 Without our dogs, the Jack Russell series would not exist. Floral Motif: Have camera, will click it.